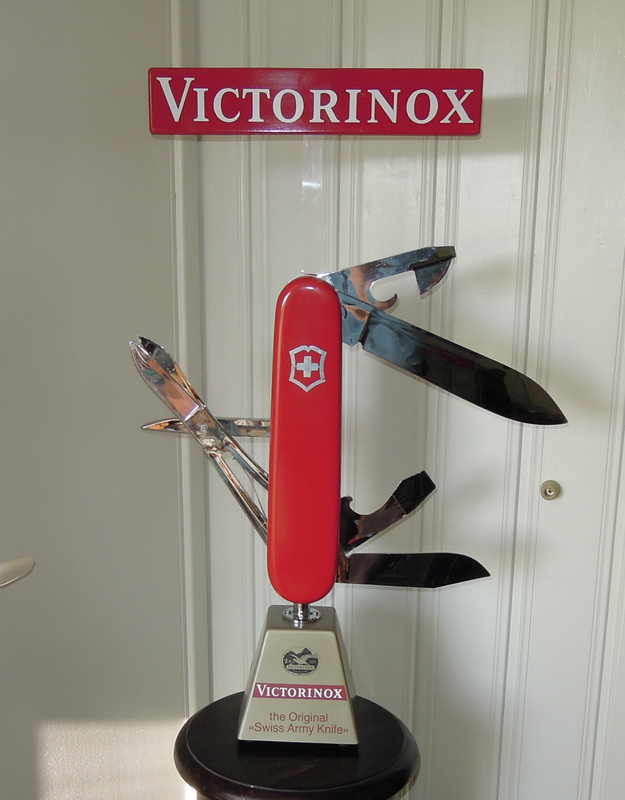 This is my latest knife :)) Victorinox Electric display knife and it works and the functions move. 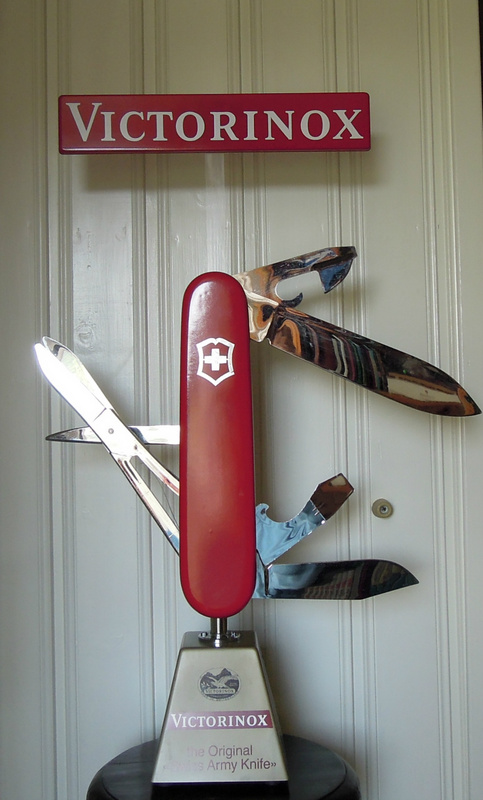 Really cool object for a SAK enthusiast. Stor takk til selgeren! 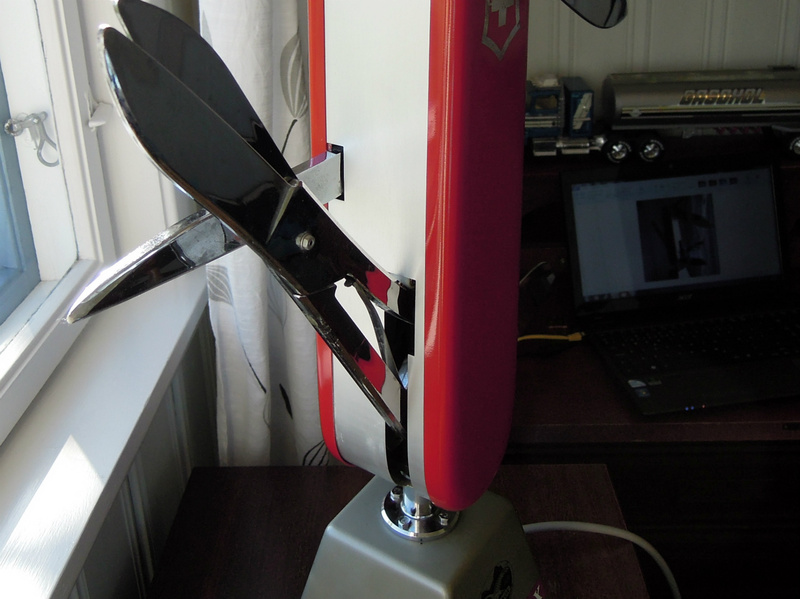 The display knife is very interesting. It is extremely reflective but i found a spot for pictures. 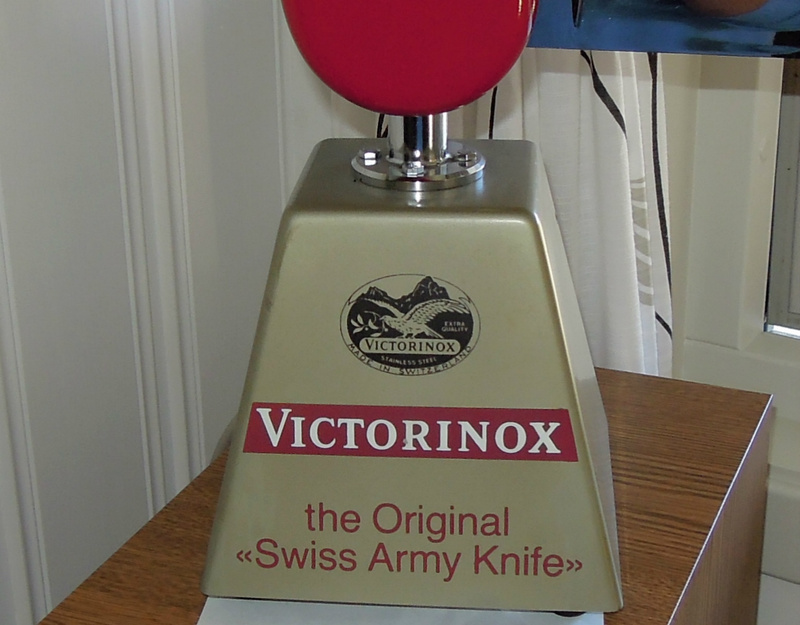 Its been made many of these electric knives in history with different types. Remember that under it there is a switch for 220 Volts or 110 Volts. I already knew this and the switch was on 220 when i got it. 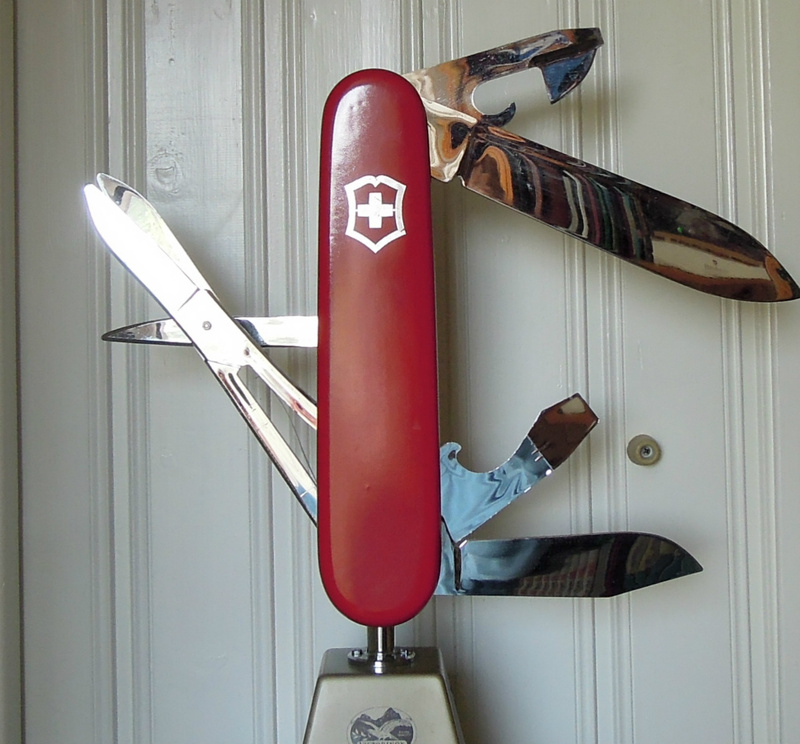 The scissors, flat screwdriver, knife blades and can opener moves. The latest models made today are a bit different electrically and more. There is also a serial number under them. These are usually not for anyone else than retailers i believe. It is interesting that the tang stamp is on the backside of the model and it is the correct side for the stamp on the pocket knives. This stamp was used from 1987-2004/2005. I am not sure if this relates to this model. To me this Electric model could be from the 1990s. You do not get tired of this model because you can stop the blades in the position you want when the electrical supply is cut. It is also interesting that the small blade is with a clip. The change to a non clip shape happened in 1973. maybe is continued on this model because it is easier distinguised as a knife blade?? This emblem or trademark is extremely interesting. 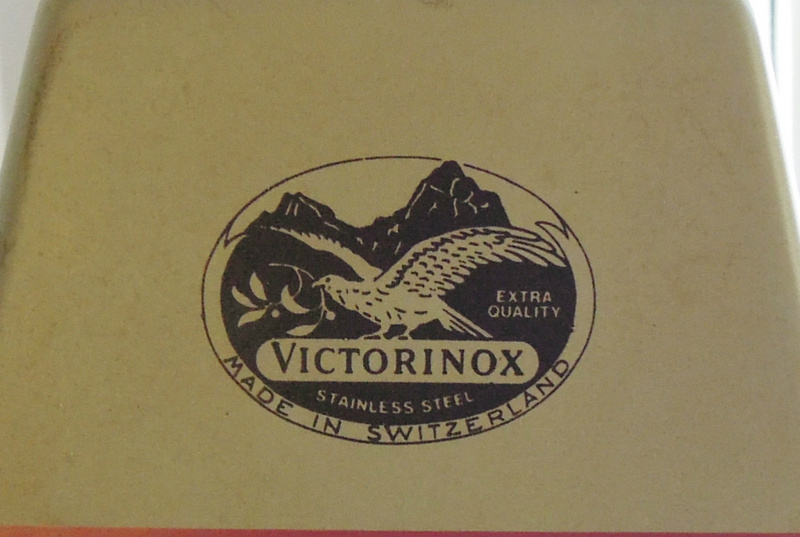 You can find trademarks: 1926, 1950, 1950/68, the last one is very similar to the one on the picture but not the same:)) You can still find this used today. This display knives are in a sence special to own and one should be aware on this. My impression is that one should not use it unauthorized in a shop or for sales with SAKs. This should be clear for all collectors i believe too. The stamp is correct with the edge to the left. The sign is also interesting and it is attached in way that is easy to disassemble. 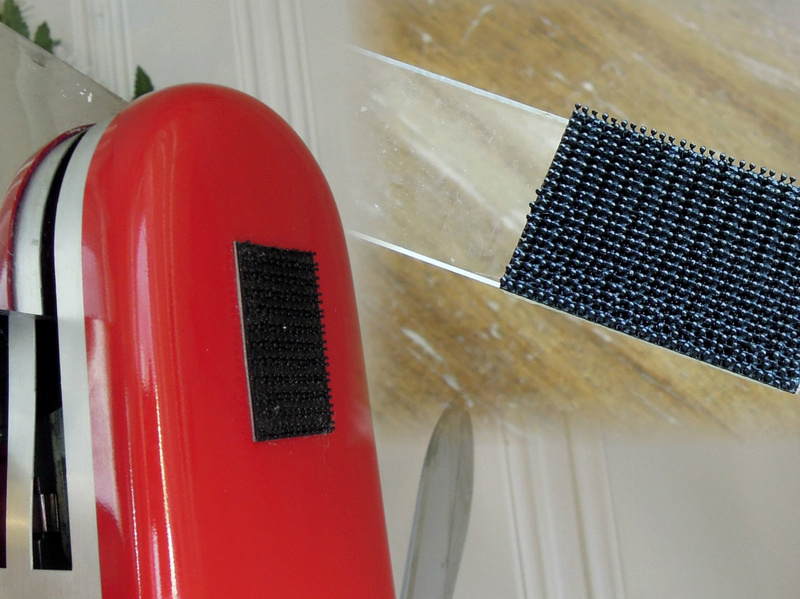 It is not Velcro, it is a more interesting method that is more firm. It is easy to open the plastic covers. 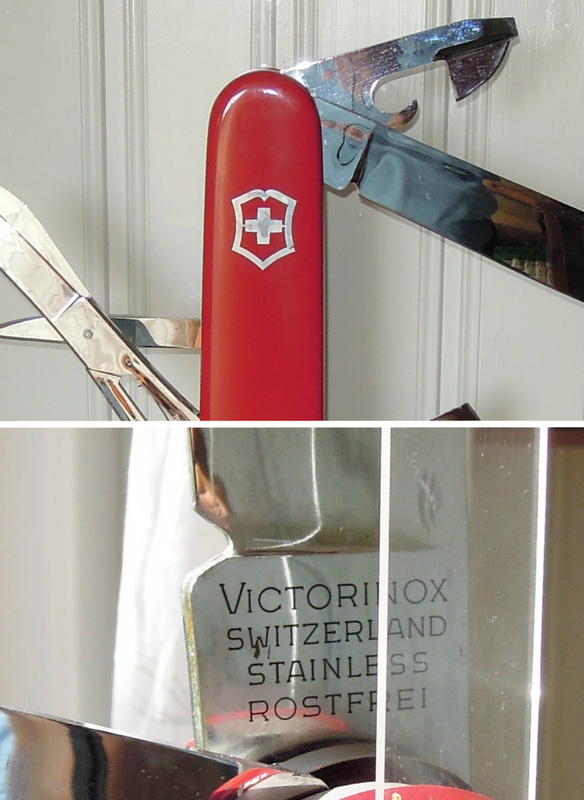 Victorinox use different trademarks, emblems and identification on the products. 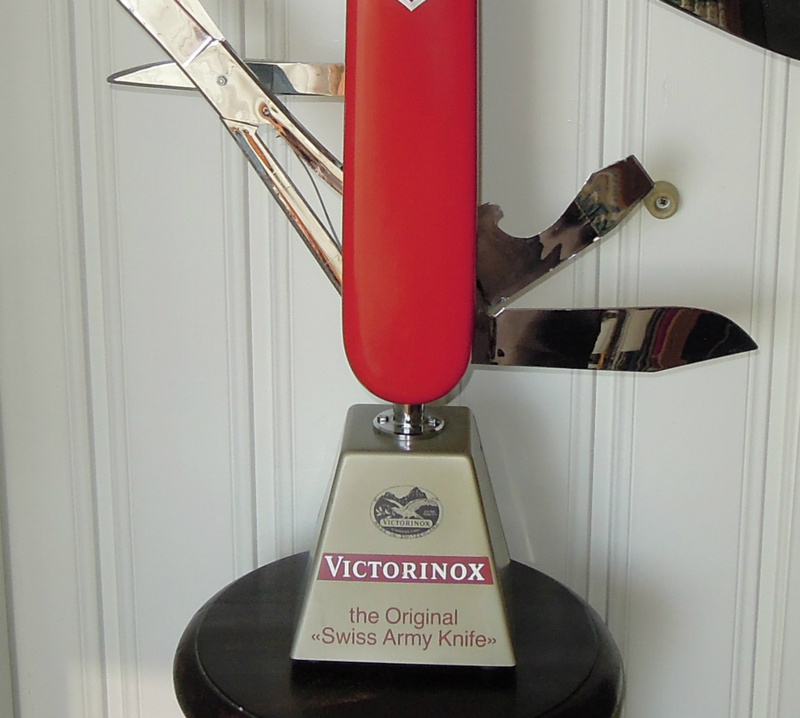 The display knife is made for display/advertising purposes. 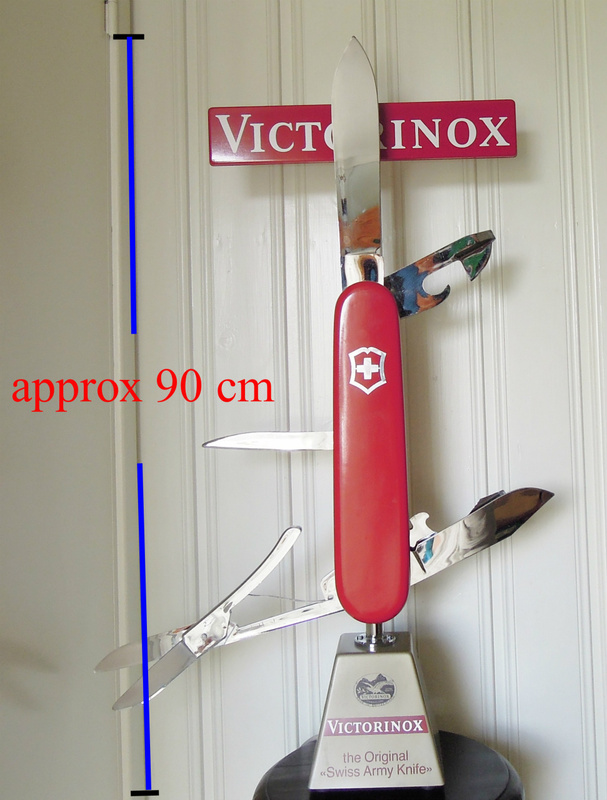 You will find that the electric display knives are made with variations on the identification. The awl is stationary and does not move on this. 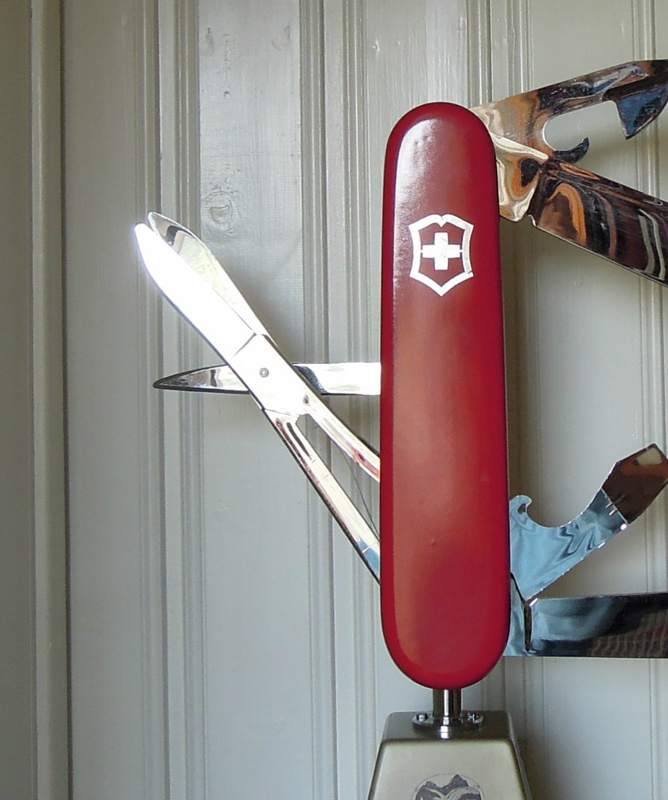 It is obvious that such knives with moving parts got a factor that would draw attention. This is not negative in any situation i feel. 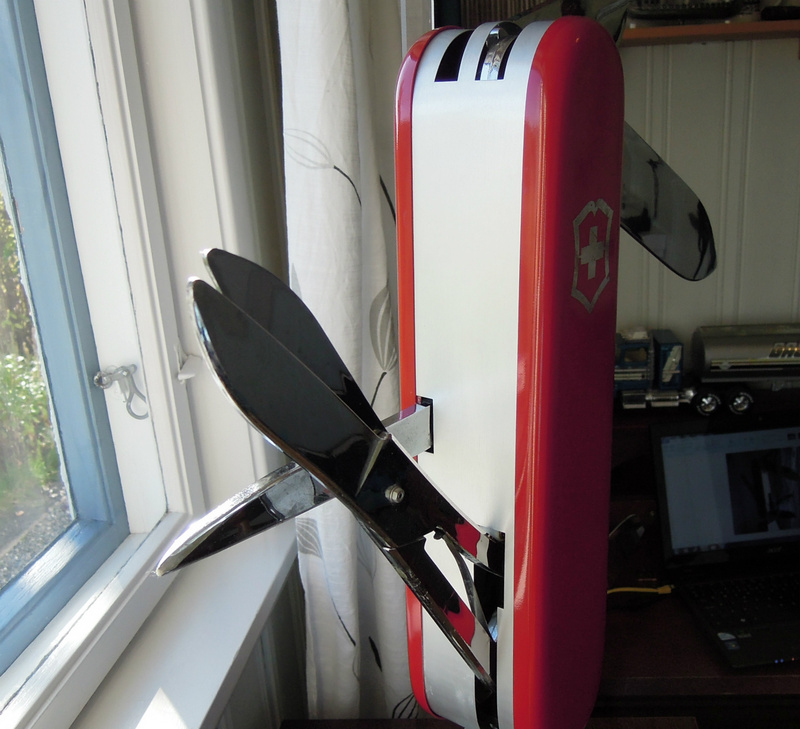 It is a very fun and interesting device. It is not boring for anyone i would believe. The holder for the sign is made of translucent plastic that is nice because the sign looks to be hanging in the air. 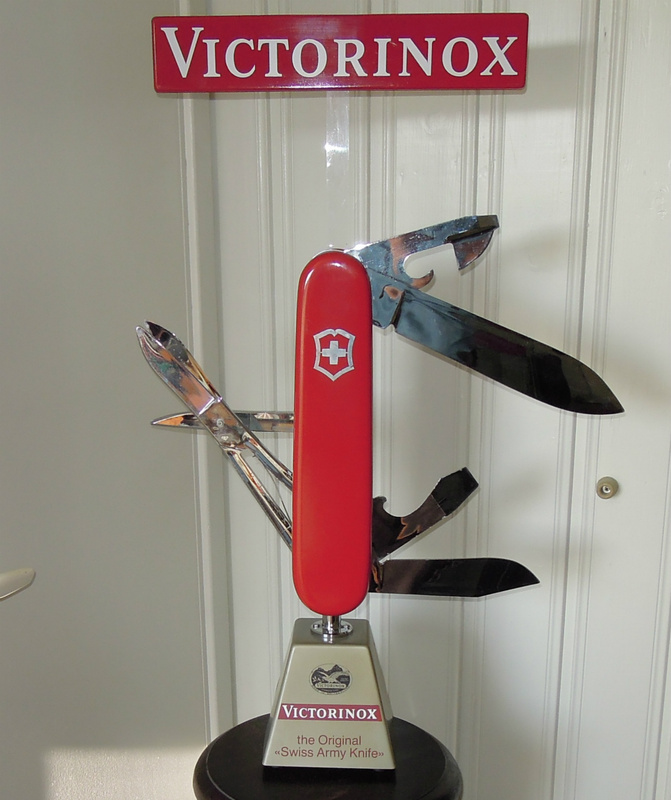 The Electric moving display knives was used here in Norway in hardware stores. Some may wonder what SAK model it resembles, to me it is probaly the 91mm range. It does not have a corkscrew. The closest 91mm may be the old Traveller before the Climber. Because of the tool configuration that is but it does not resemble any model i believe but more a functionalty.The placing is also wrong. Here in Norway we have 230 Volts 50 Hz, we changed from 220 into the 230 Volt. Usually it is no problem with a device for 220 Volt because the voltage will vary from 210-250 some places. Anyhow on a older Electric moving device one should always remove or cut the electricity when you are not using it. I will just use it to show people from time to time. 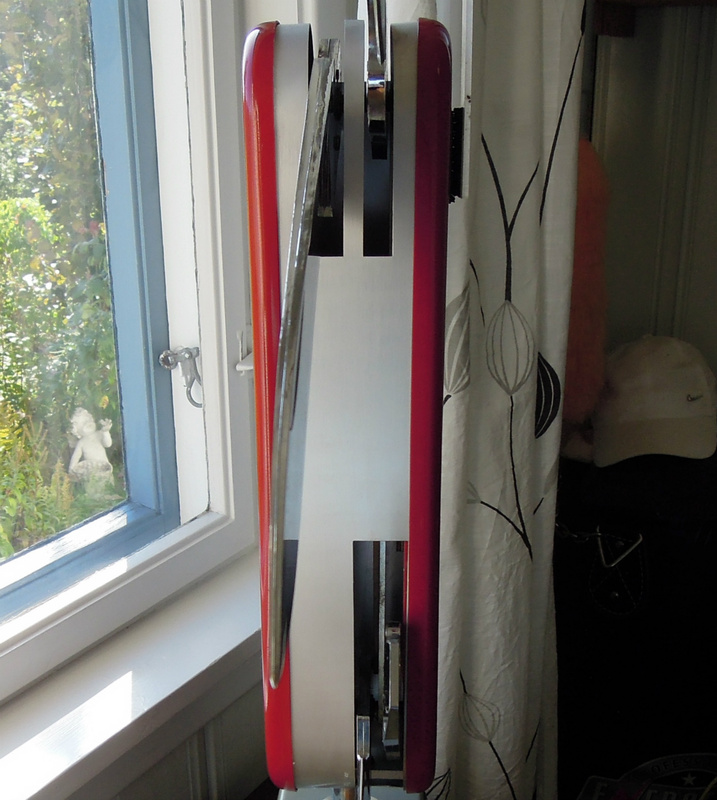 It does not flip over and stand firm and it got 4 rubber stands for vibration and secure stand. 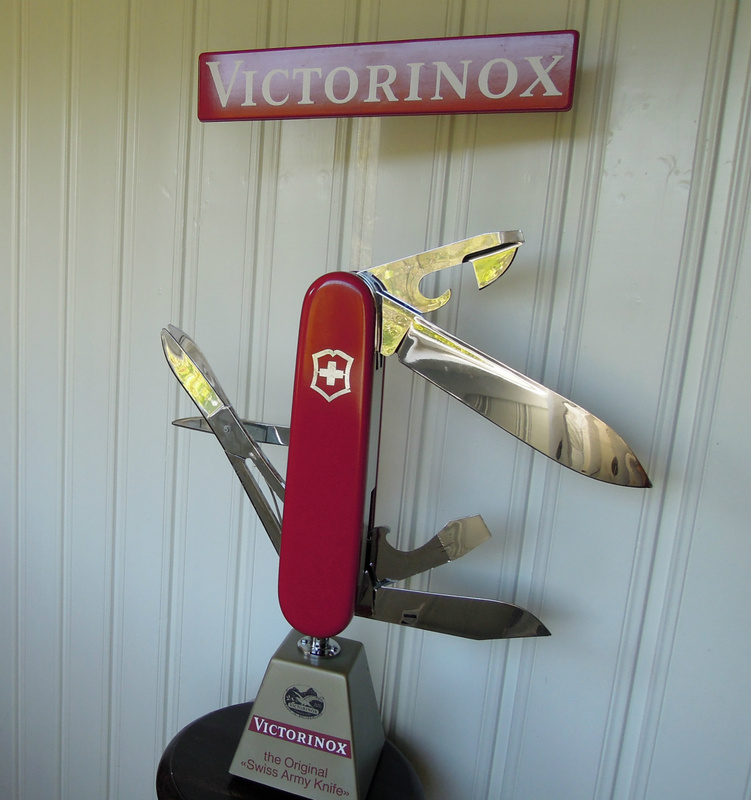 It is no doubt that these knives are made with durability and quality that should last for many years. 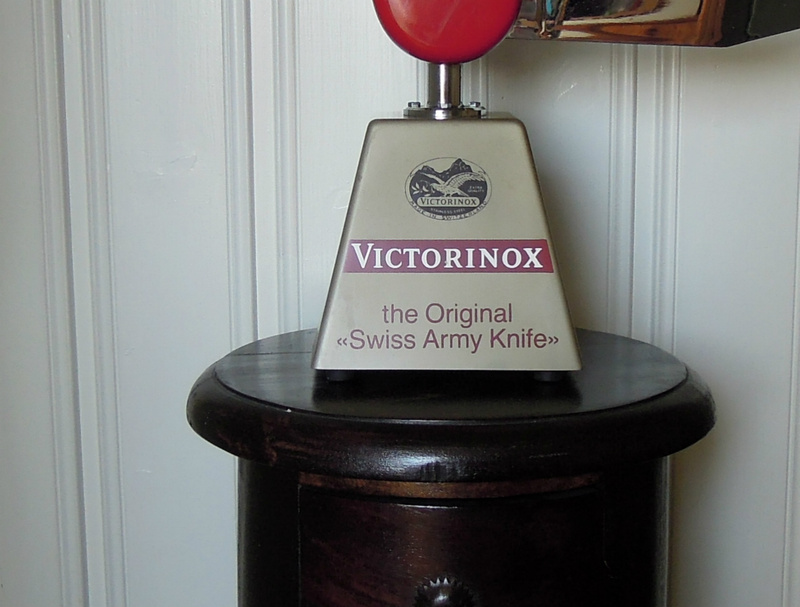 The emblem and stamp on any Victorinox product is the key for identification and philosophy. This Electric model is "Typ E 94" Would be fun if this is related to a year. Not sure. Other info: 110V/220V(Volts) 50 Hz(Hertz) 2 W(watts). Remember the switch! Can be used without any problem on 10 or 16 ampere Circuit. 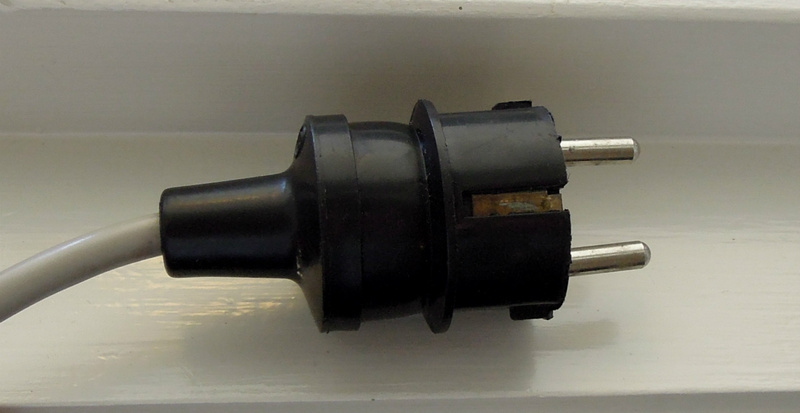 The plug is if original ground F type, it is an older design and interesting. The plug will or may vary for different countries. This plug can be opened and many times today they are made not to be opened. 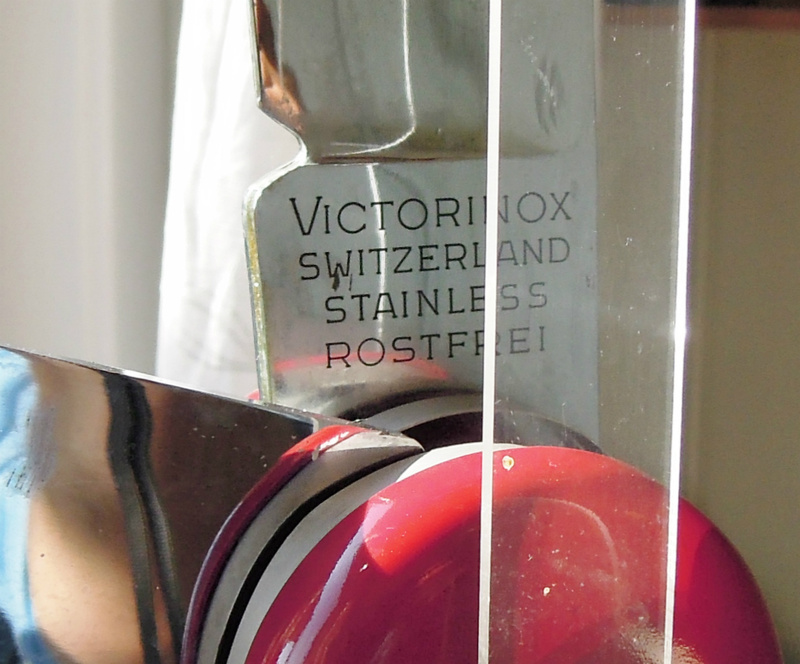 Under the stand for the Victorinox Electric knife there is a symbol and it is 1 fase alternating current motor.